The Lacobel and Matelac 2020 range of painted glass products features an attractive palette of contemporary colours that deliver a fresh boost for the buildings and furnishings they grace. The Matelac matt glass colour chart has been expanded to include the same number of shades as its glossy alter ego, Lacobel. Building on the success of its first Lacobel T collection, AGC now offers a wider range of this pre-painted glass that processors can immediately cut and toughen or heat-strengthen at their plant. Strong and safe to use indoors and out, architects have endless design possibilities. And with 10 contemporary colours to choose from, Lacobel T is the perfect glass to enhance any interior and façade. To complement the existing Lacobel T colour range and inline with today’s trends towards smooth and matt finished surfaces, AGC now offers its unique toughenable painted glass range with a satin finish: Matelac T. Choose from the common range of 10 contemporary colours and play with contrasts and perspectives. With its high-quality satin finish, Matelux strikes a delicate balance between offering privacy and letting in light. AGC’s unique industrial acid-etching process on large sheets is subject to rigorous quality controls, ensuring uniformity and continuity. Mirox New Generation Ecological mirrors reflect AGC’s ongoing quest for innovation and the constant improvement of their range. Everything you need to know is in the name. With unparalleled light transmission of 92% (4 mm) and excellent colour rendering, Planibel Clearvision is the natural choice when crystal clear vision and clarity count. It’s no wonder this low-iron high-quality glass is being used more and more by architects and designers for projects requiring a high degree of transparency or a boost to colours. 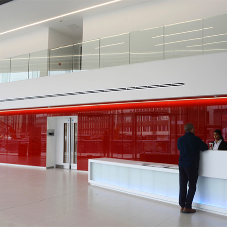 Ever keen to diversify its range, AGC Glass Europe offers a range of laminated glass that meet all safety levels, in line with the assembly used and prevailing standards. Other functions are also available: enhanced acoustics, thermal insulation, solar control and design. 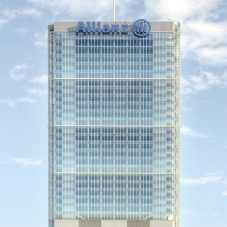 In line with the companies sustainable approach, AGC offers a premium mirror, Mirox 4Green. This product delivers the same high-quality performance as Mirox MNGE but stands out for its use of lead-free paints and its high opacity, making it ideal for backlit applications.